Help employees keep their name out front with these Clip Style Badge Holders. The badge holders feature a portrait orientation for easy insertion of 2-1/4" x 3-1/2" badge inserts, business cards, or security cards. A strap fastens each badge holder to a convenient metal clip that enables the wearer to keep the ID visible at all times. 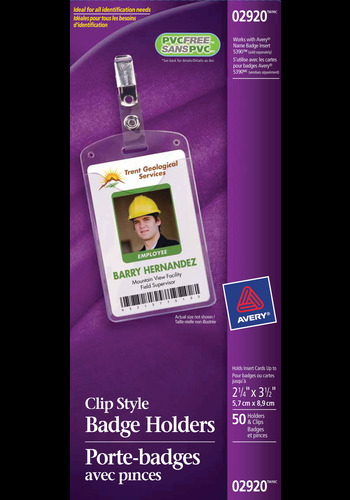 Help employees keep their name out front with these Clip Style Badge Holders. The badge holders feature a portrait orientation for easy insertion of 2-1/4" x 3-1/2" badge inserts, business cards, or security cards. A strap fastens each badge holder to a convenient metal clip that enables the wearer to keep the ID visible at all times. The garment-friendly clip attaches snugly but won't damage fabric. ID badges are clearly visible through the translucent, flexible material, so names and faces are in view at all times. Easily create customized badge inserts with Avery® Name Badge Inserts (available separately) for multi-date meetings, seminars, visitors and more using free templates with Avery® Design and Print Online software.